Is Maurice Newman telling Tony Abbott he should fire him? Maurice Newman is a "big nob" in Australia. Or so I'm told. He used to be Chair of the national broadcaster, the ABC. The Prime Minister thinks so highly of our Maurice that he made him Chair of his Business Advisory Council. I don't recommend anyone taking any advice from Maurice. "...if I had financial advisers who were 98 per cent wrong I'd fire them." Emma Alberici interviewed him on ABC's Lateline this week for a comedy special and here are a few snippets. See what you think. EMMA ALBERICI: It's no secret that you don't agree that man-made CO2 is causing global warming. Given there is now consensus among 97 per cent or so of climate scientists across the world that the view - around the view that human activity is responsible for climate change, what would it take to convince you? EMMA ALBERICI: There have been roughly three that have come up with that. MAURICE NEWMAN: ...So the 97 per cent doesn't mean anything in any event because science is not a consensus issue. Science is whatever the science is and the fact remains there is no empirical evidence to show that man-made CO2, man-made emissions are adding to the temperature on earth. That's not what he facts show. Maurice, keep up why don't you. There has been empirical evidence for the greenhouse effect since Tyndall's experiment way back in the middle of the 1800s. It even hit Australian newspapers at least as far back as 1884. 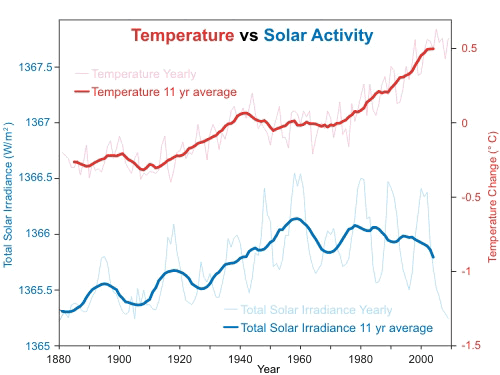 Maurice Newman says "it's the sun"
MAURICE NEWMAN: ...If you want a correlation between global climate, don't look to CO2, look to the sun's activity, there will you find a very close correlation. Oops-a-daisy. Maurice's sun is going in the opposite direction to temperature. Will he change his tune? Unlikely. He's one of those "utter nutter" deniers who'll just say he won't "pay any attention to that... "
MAURICE NEWMAN: I just look at the evidence. There is no evidence. If people can show there is a correlation between increasing CO2 and global temperature, well then of course that's something which we would pay attention to. Not true, Maurice. There is a lot of evidence and you don't pay it any attention and don't appear to have ever done so. In fact, it was only a minute or so back that you dismissed three separate pieces of evidence you didn't like and said "we don't pay any attention to that"! Maurice Newman rejects scientific projections and opts for unsubstantiated "predictions"
MAURICE NEWMAN: ...And as I said, we look at the climate models, 98 per cent of them were wrong. In my old business, if I had financial advisers who were 98 per cent wrong I'd fire them. EMMA ALBERICI: That it's a pause. I guess that's what scientists say. It's a pause. They look back 800,000 years as I understand it, so 17 years in the scheme of things isn't an enormous amount of time. MAURICE NEWMAN: I agree, but then you've got scientists, climate scientists now in Norway, in Germany, in Russia, in America, saying we're now going in for a period of 30 or 40 years of increasingly cool climate conditions. Ha ha ha. Maurice "clown" Newman doesn't agree with carefully constructed, physics-based scientific models that have been remarkably close to observations so far. He dismisses the work of generations and thousands of climate scientists, but he's happy to take the solemn predictions from a handful of denier shysters from places like the Heartland Institute and EIKE! What a nutter. EMMA ALBERICI: I'll only ask you one more questions on this because I do want to talk about other things, but both Marius Kloppers and his successor at BHP Billiton Andrew McKenzie agree that climate change is human induced. So what if those 97 per cent of climate scientists and all business people across the world, like the likes of Bill Gates and Richard Branson and the miners here in Australia, what if they're right and you and the scientists you quote are not right. Doesn't it make sense to have a policy that at least transitions Australia to cleaner fuel sources? MAURICE NEWMAN: Emma, let's not confuse the issues. Cleaning the atmosphere, which is what carbon pollution is about, not CO2, CO2 is not a pollutant. But cleaning the atmosphere, being more efficient, all of that makes sense. That's got nothing to do with climate. That's to do with economics and being efficient. MAURICE NEWMAN: But I would say to all of those people who are arguing that CO2 creates global warming and man is adding to the global warming to show the empirical evidence of where this is so. Because I'm saying to you that where this originates is from models. Computer models which are wrong. Now, if you can show me where there is some sort of correlation that proves beyond doubt that what we have is global warming as a consequence of CO2 and man's contribution to CO2 in the atmosphere, well then we can have a different conversation. Hmmm, he wants empirical evidence. He's not happy with all the empirical evidence he's been spoonfed with over the years. Let's see if we can distil it down for him. CO2 is a greenhouse gas, it's what keeps Earth warm and allows species like ours to exist. We wouldn't be here if not for CO2. Adding more CO2 makes the earth warmer. It's like if you add more sugar to your cup of tea it makes it sweeter. Or adding more petrol to your car lets you drive further. It's all about supply. You can click the chart to enlarge it. 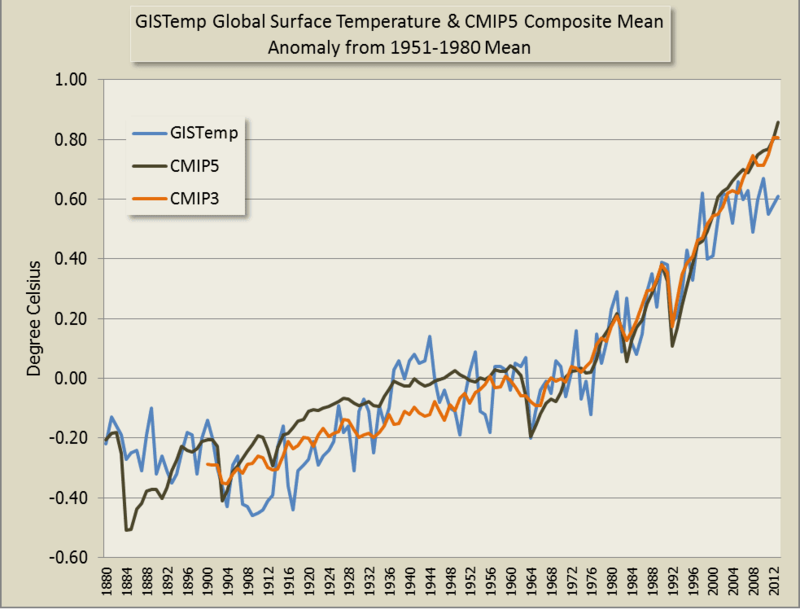 What it shows is the Northern Hemisphere temperature went up when CO2 went up. It also shows that when a volcano of any size erupted, temperature dropped. It also shows that when the sun wasn't as active then temperature dropped a teensy bit, but nothing like the reaction to adding more CO2. Maurice Newman isn't just 98% wrong, it's virtually certain that he's 100% wrong! So will Tony Abbott follow Maurice's suggestion? Maybe it's a bit unfair of Emma to take advantage of poor old Maurice Newman's failed intellect, letting him make a complete and utter idiot of himself on national television. Lateline is meant to be for current affairs, not comedy. If you want comedy, try Clarke and Dawe from seven years ago in 2007 (or it might have been from 2006). Back in the days when John Howard, Tony Abbott's patron, was Australia's Prime Minister. Just before he lost not just the election but his own seat. It was a really bizarre performance. If I were Abbott or any other LNP parliamentarian (what did you think Malcolm Turnbull and Greg Hunt?) I would be highly embarrassed to have poor old Maurice so closely linked to your government and parties. What do you think, PM? You surely don't agree, with him, given you have moved beyond your "climate change is crap", or have you? If I were plunder ideologist Abbott I'd be quite happy with this loon and throw another ten billion down the JSF drain. "If you look back over history, there's no evidence that CO2 has driven the climate either"
Ok Mr Newman, let's do as you say, and look back over history. 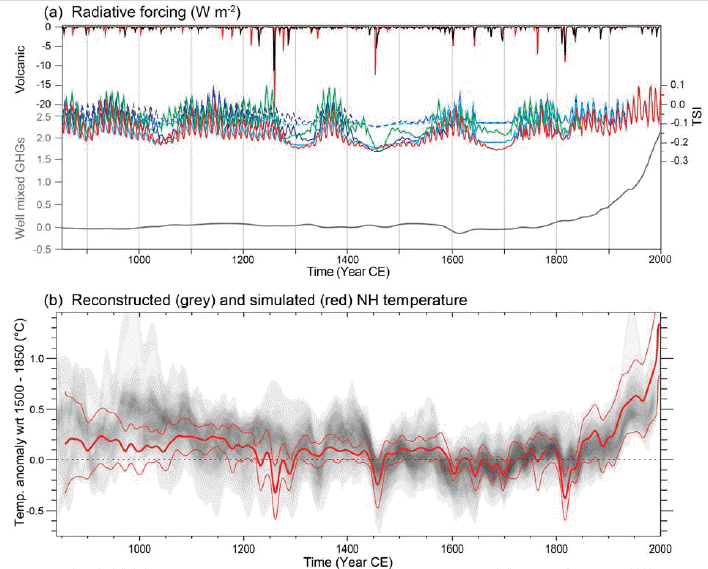 Clear evidence that a greenhouse gas has DRIVEN the climate. Really Mr. Newman, no evidence? What a complete doofus!! "MAURICE NEWMAN: I just look at the evidence. There is no evidence." Ummm... how does he look at something that (he says) isn't there? So I wouldn't expect him to understand science. Sadly, it is no mystery why he has gotten where he is now. Off topic, but would it be possible to apply your animated GIF techniques to this compilation? Let me know if you'd like to make any changes.